Practices must be RWAF members to apply to join the list. Membership gives the vets access to advice from our Specialist adviser Richard Saunders BSc (Hons), BVSc, MSB, CBiol, DZooMed (Mammalian), MRCVS, RCVS Specialist in Zoo and Wildlife Medicine, RWAF Veterinary Adviser (pictured), should they get a tricky case they want to discuss. Richard also issues quarterly updates on the latest developments in rabbit medicine and all their clinical staff members get a significant discount when attending our conference, so we know that top quality training is available to them. We can’t guarantee any of that for vets who aren’t RWAF members. 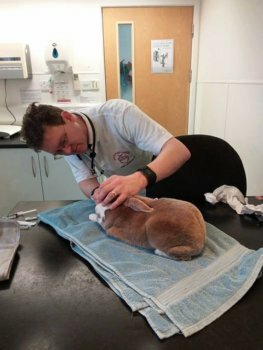 Once a practice has joined they are eligible to apply for the Rabbit Friendly Vet list via an online form, and it’s Richard who reviews their answers to ensure the practice meets the standard required for inclusion. We do not simply add vets because somebody has said they like them. A note about rabbit specialists. We are often asked to put owners in touch with a ‘rabbit specialist’. The term ‘Specialist’ is a protected one, and the Royal College of Veterinary Surgeons (RCVS) doesn’t hand out that honour lightly. The number of Specialists in Zoological Medicine and Exotic Animal Medicine (the disciplines which include rabbits) changes from time to time, and is currently about 12. One of those is our own veterinary adviser, Richard Saunders. There are vets who have more specific qualifications (RCVS Certificates and Diplomas, or European Diplomas) than general practitioners and the RCVS holds a list of these. Inclusion on our list does not mean that the vets are Specialists or Referral vets – just that they meet a minimum criteria as highlighted above.